Thanks to Dr. Jaya Bajaj and Dr. Michael Esposito, North Shore Long Island Jewish Health System, New York (USA), for contributing this case. To contribute a Case of the Week, follow the guidelines on our Case of the Week page. 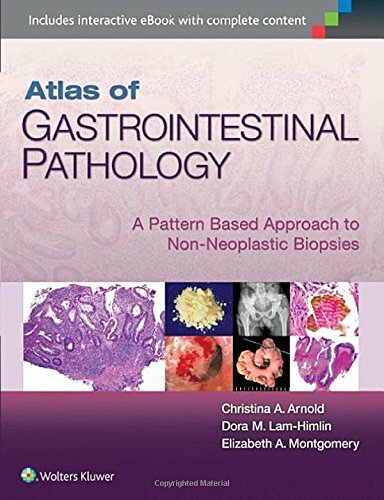 Congratulations, and thanks to everyone who supports PathologyOutlines.com by shopping at Amazon.com through our website. (2) Thanks to you, our traffic continues to increase. Average daily visits in June 2015 are up 12% from June 2014 to 20,548. There were over 35,500 visits to the Jobs page, over 5,500 visits to the Fellowship pages and over 7,000 visits to the Conference page! (3) Our Feature page for July is Digital / Imaging / Photography, and highlights our advertisers Milestone Medical and Photodyne Technologies. It also contains an original short article, "Forensic Photography: Getting the Best Shot", by Jaleh Mansouri, M.D. (4) See the latest CME listings, New Product announcements and Webinar postings on our site. (5) We are again accepting interesting cases for Case of the Week until our queue expands to 40 cases. Please note that we only post 3 cases per contributor per year, so do not send more. For information on contributing a case, visit our main Case of the Week page. A 52 year old woman presented with a progressive cough, dyspnea and wheezing. A chest CT scan revealed an endobronchial lesion of the left mainstem bronchus, which was biopsied. 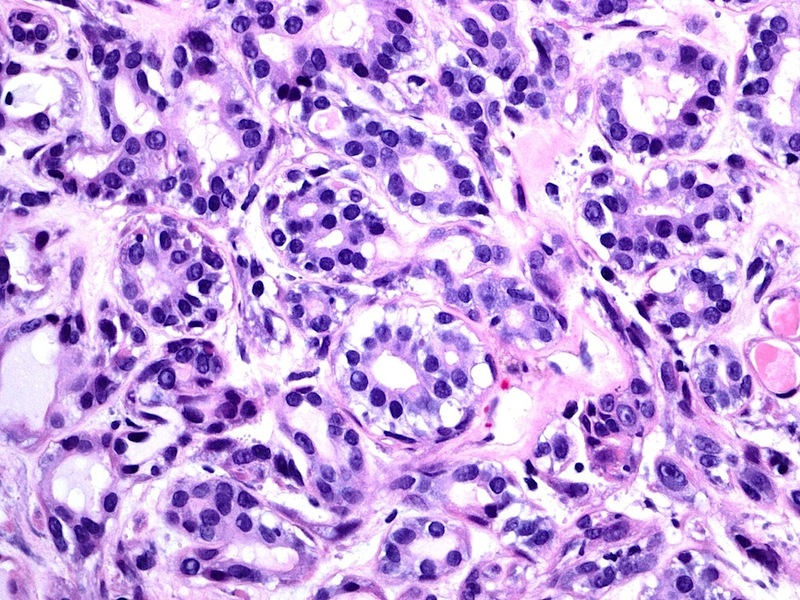 The clinical impression was carcinoid tumor or endobronchial neoplasm. 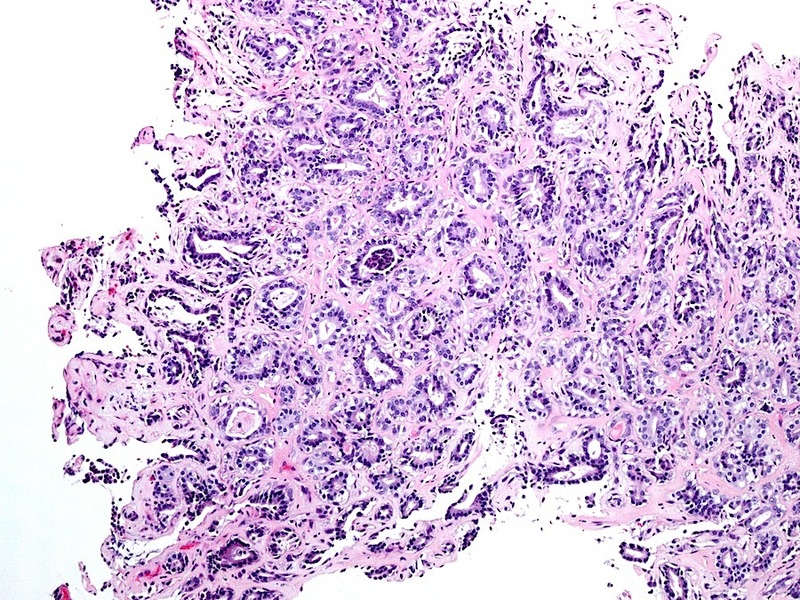 Epithelial-myoepithelial carcinoma is a low grade malignancy, very rare in the lung, that arises from submucosal bronchial glands. 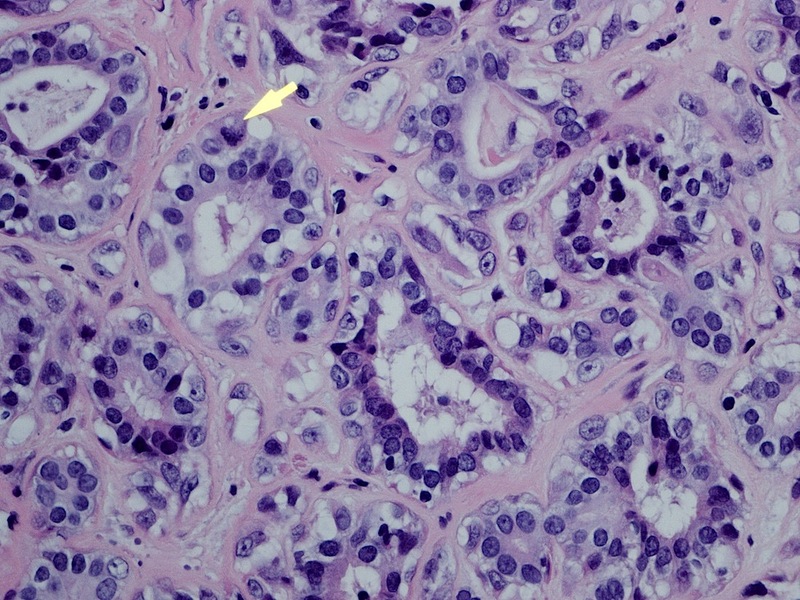 It mimics the more common salivary gland tumor. In the lung, the tumor affects men and women ages 40-60 years, and often presents as a bronchial intraluminal polypoid mass which may invade the pulmonary parenchyma (Korean J Thorac Cardiovasc Surg 2014;47:59). 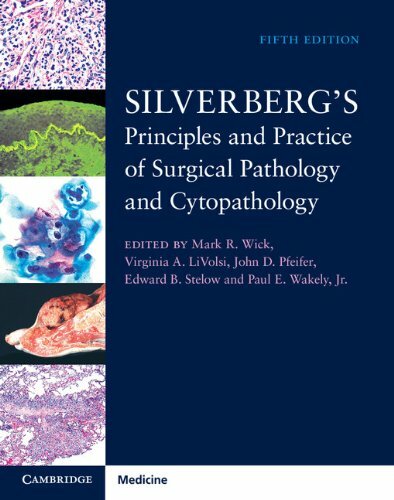 Histologically, it is a well circumscribed mass with a pushing margin. It has a distinctive, biphasic proliferation of epithelial and myoepithelial cells with formation of bilayered ductlike structures, with inner epithelial cells and outer clear myoepithelial cells (Case Rep Pathol 2012;2012:319434). There is no myxoid or chondroid stroma and no perineural invasion (Hum Pathol 2009;40:366). 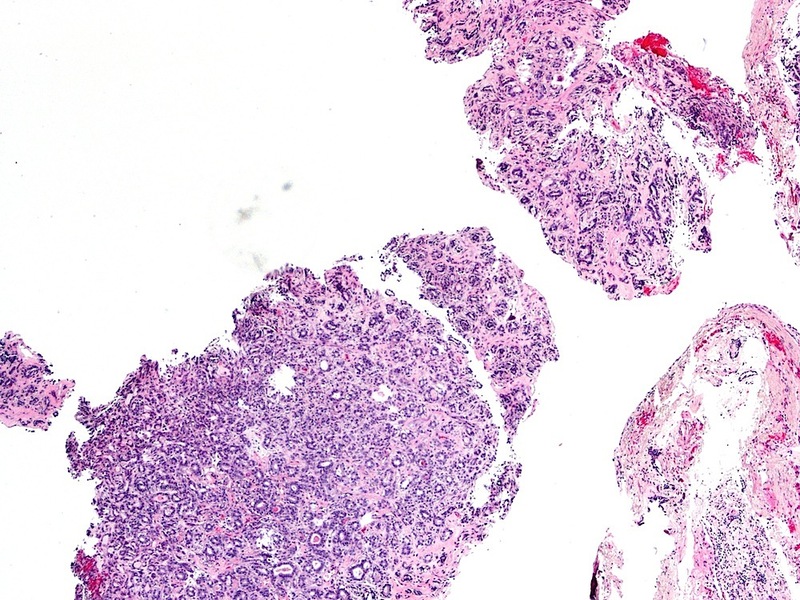 The epithelial cells are immunoreactive for cytokeratin and EMA, but negative for S100 and HMB45. The myoepithelial cells are immunoreactive for S100 and MSA, and may be weakly positive for keratin. In this case, immunostains were not performed. 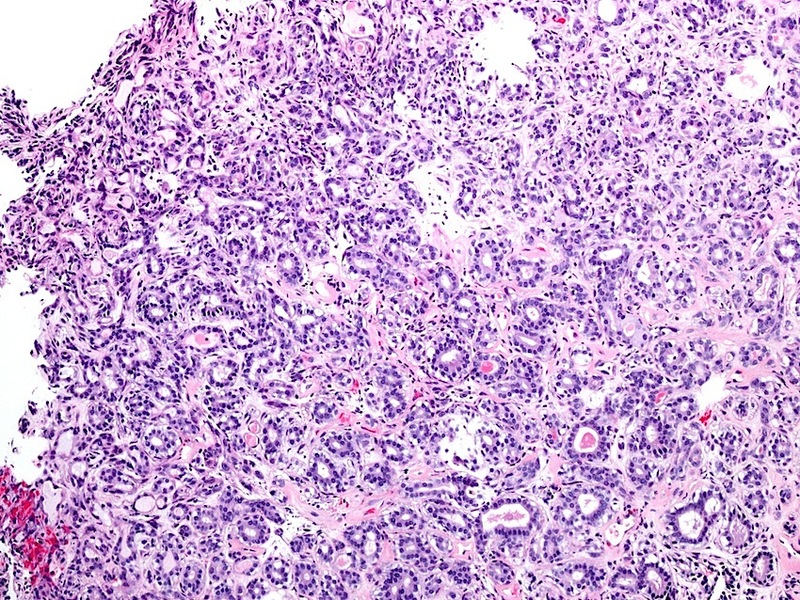 The differential diagnosis includes other salivary gland tumors, including acinic cell carcinoma, adenoid cystic carcinoma with a tubular pattern, mucoepidermoid carcinoma and pleomorphic adenoma, as well as metastases to the lung (Eur Arch Otorhinolaryngol 2006;263:1158). Excision is usually curative, although recurrence and metastasis have been reported (Lung Cancer 2014;83:416, J Thorac Oncol 2013;8:1578, Case Rep Oncol Med 2011;2011:610383).